On Thursday, the tent that served as a home for the 13 people that form the family of Omar Bisharat, as well as his two animal shelters and his animal barn have been destroyed. 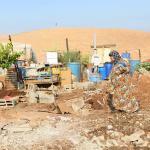 Al Hadidiya has already been hit innumerable times by demolitions as Israel wants to wipe out this community. Al Hadidiya has turned into a bastion of steadfastness for the entire region of the Jordan Valley, where it is based. During the same day, in al Khader, in the Bethlehem district, the Israeli military razed 5 dunks of land belonging to Muhammad Moussa. Al Khader is completely engaged by illegal settlements and of the village's historic 22,000 dunams about 20,000 are almost entirely cut off by Israel’s apartheid wall. Threeand illegal settlements, Efrat, Elazar and Neve Daniel are built on al Khader’s lands. A day earlier, on Wednesday, illegal settlers from Bruchin settlement have cut down around 40 olive trees belonging to Jamal Othman Salameh from Bruqin village.